Synthetic Aperture Radar Interferometry (InSAR) is the main technology for space based ground motion measurement. It has been in use for more than 25 years. Early applications and demonstrations using pairs of images showed the significant displacement caused by earthquakes. In the late 1990s, a new suite of multi-image InSAR techniques were developed that revealed movements of millimeters per year. The application of these techniques was made possible by the unique archive of radar images acquired by the ERS-1 and -2 satellites beginning in 1992. These satellites acquired images in a consistent geometry as often as every 35 days. Other civilian SAR satellites followed, including Radarsat-1 and -2, and ENVISAT, as well as a number of high-resolution commercial SAR systems. Building on the success of many InSAR demonstration studies, a number of initiatives emerged to streamline the efforts. In particular the TerraFirma project (2003-2014), PanGeo (2011-1014); the Italian Piano Straodinario di telerilevamento Ambientale (2008-2016); as well as a number of spin-off projects building on top of TerraFirma and PanGeo, including SubCoast, EVOSS, and Lampre. The common denominator in all these initiatives was to streamline independent activities into a unified prototype service, albeit with different target audiences. The focus was both on algorithmic and operational developments, as well as validation activities. Nevertheless, many of these initiatives were faced with a major operation limitation due to lack of systematic source of radar images and hampered by inherent restrictions of the satellite acquisition modes. The result was that it required several years of image acquisitions in order to obtain reliable InSAR results. This meant that the data was usually only processed one time and not regularly updated. 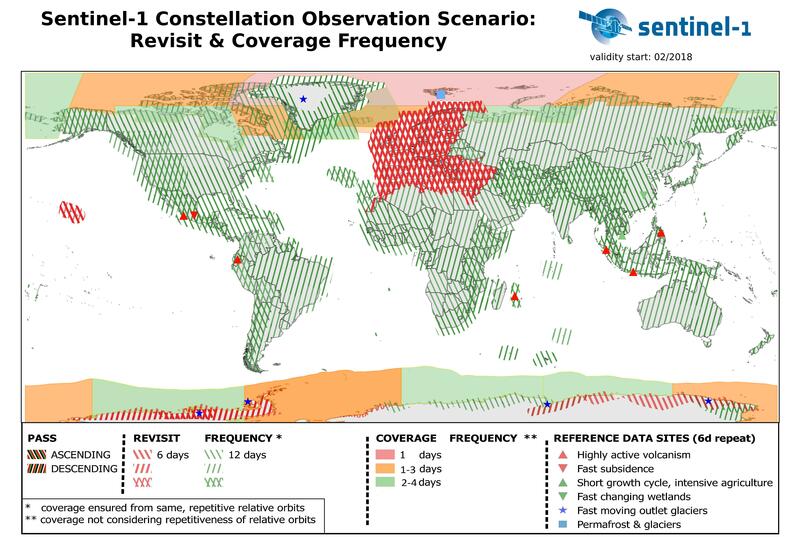 Now, thanks to the Copernicus programme, all the right ingredients are available for introducing and operating a radar-based service, including a free and open data policy, the long-term, predictable operations of the Sentinel-1 mission, high performance computational environments and the algorithmic know-how. The Sentinel-1 satellites provide a unique new opportunity to provide dynamically updated ground motion datasets. It is possible to monitor hazardous processes and see the effects of remediation efforts.